... basketball, pickle ball, booster juice, Starbucks, a pub, clothing store. Great place for activities (hockey,swimming, gym, soccer,basketball, running etc.). We take our whole family their to have some fun. Every sport activityy apperars to be covered under one roof. It is very well used on weekends. 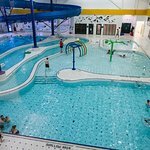 Servus Place covers all family sports / water activity needs. Servus is always great, a little pricy and can be busy but it definitely is a great gym. Pool is big and slide are fun. In junior high and now in high school everyone would hang out there. We would either swim, or eat, or just hang out. Its easy to walk for virtually anywhere and is affordable. My family and I love going here. service is always amazing. so much to do. and always clean. definitely a go to when you are in St.Albert. Get quick answers from Servus Credit Union Place staff and past visitors.